Rockwell Collins has completed the qualification test procedure for its military communication radio system as part of a potential $12.7 billion U.S. Army contract awarded in February. The company said Thursday it delivered 30 two-channel, software-defined AN/PRC-162 radios for the qualification tests under the Army’s Handheld, Manpack and Small Form Fit competition. Rockwell Collins, General Dynamics and Harris were selected to compete for the HMS contract to supply tactical radio systems, accessories and support services to the Army. The military branch is authorized to buy more than 60,000 radios throughout the 10-year program and expects full-rate production to start in fiscal year 2017. Rockwell Collins noted the competition will move forward to the customer test evaluation phase that aims to validate interoperability with various radio systems. 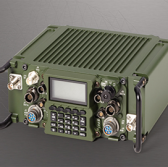 AN/PRC-162 is based on Rockwell Collins’ TruNet networked communications family of products and is designed to host multiple waveforms, point-to-point data and Mobile User Objective System in a software-defined radio architecture.